Bidding on the competition? Here's a lesson from Equifax. When a credit monitoring company Equifax was hit by a cyberattack that may have affected about 143 million Americans, people flocked to Google to find out what to do. 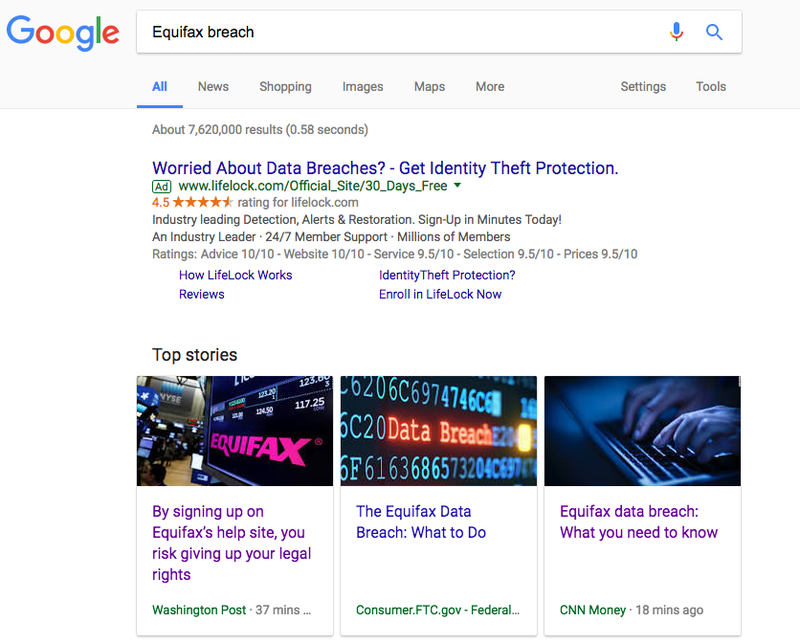 As "Equifax" search query made it into the trending list on Google, the savvy marketing team at Lifelock, an identity theft protection company, quickly bid on the branded term and snagged the first ad position. Lifelock's smart bidding strategy is an example of how PPC marketers can leverage online search trends and breaking news to drive top-of-the-funnel leads and boost brand awareness. This strategy is especially effective when you reach people in highly receptive mindset (which was the case with Equifax). In one Google study, they found that paid search can be as powerful as traditional media such as TV and print -- and more cost-effective. In this article, we’ll share tips on how you can use PPC marketing to increase brand awareness. Why should companies care about brand marketing? A company's brand is one of its most valuable assets. Apple’s brand, for example, is worth $170 billion by Forbes’ count. Naturally, companies invest in branded campaigns to keep the brand top-of-mind and defend against competition. Most often, marketers use pay-per-click advertising to capture conversions at the bottom of the sales funnel, but PPC can be just as effective for brand awareness. First, PPC marketers can react to news and industry changes almost instantly. What takes PR people days, weeks, months, and years, a PPC expert can sometimes test within an hour, depending on the traffic volume. Second, PPC brand marketing is very easy to measure. Where brand marketers struggle to justify return on investment, PPC marketers can quickly show hard and fast numbers. So very quickly, and at a fraction of the cost, PPC marketing can amplify a brand’s voice and even protect its reputation. Below, we've assembled three very recent marketing case studies. Whether you're testing traditional media, dealing with a PR crisis, or attending a trade show in the next couple of months, you can use paid search to protect and boost your brand. Last week, Visa’s marketing team put together a last-minute video ad to promote recovery efforts after Hurricane Harvey. The original ad, scheduled to appear in the NFL kickoff game, took the company over a month to produce and featured Visa’s mobile payment features. Shot on iPhone in just a few days, the new ad was a little blurry. But the production quality didn't matter because the ad stood for a cause. However, Visa missed out on the opportunity to use paid search to amplify traditional media. Search and social media advertising can work in tandem with TV to track affinity and gauge response in real time (something the majority of Super Bowl advertisers have tested). 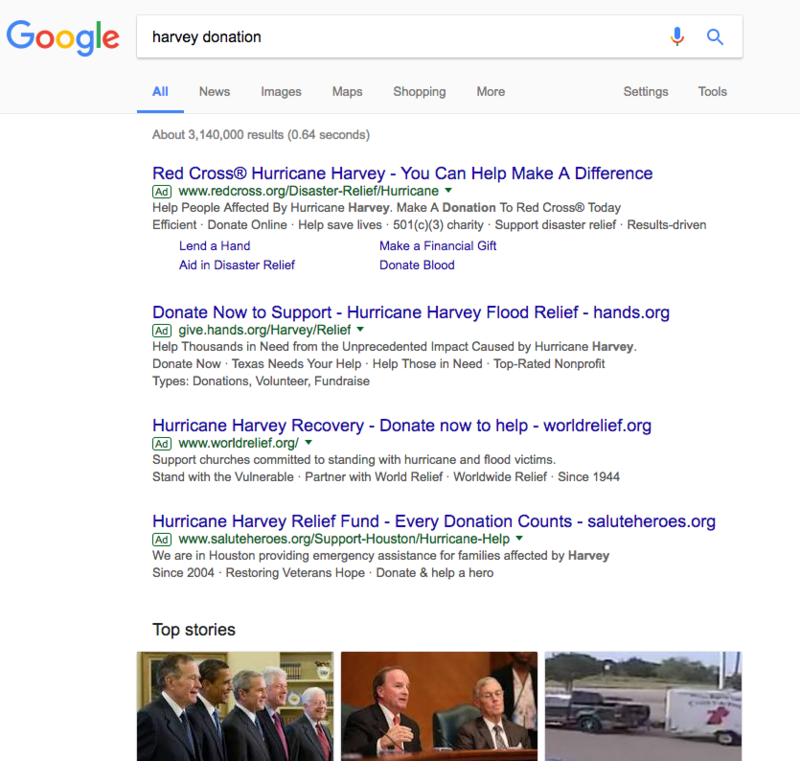 Visa could have easily boosted the impact of their campaign by bidding on relevant terms (such as "harvey donation" -- their key message in the NFL ad). When Samsung Galaxy Note 7 smartphones suddenly started catching on fire, the manufacturer issued formal apologies to customers and suppliers. 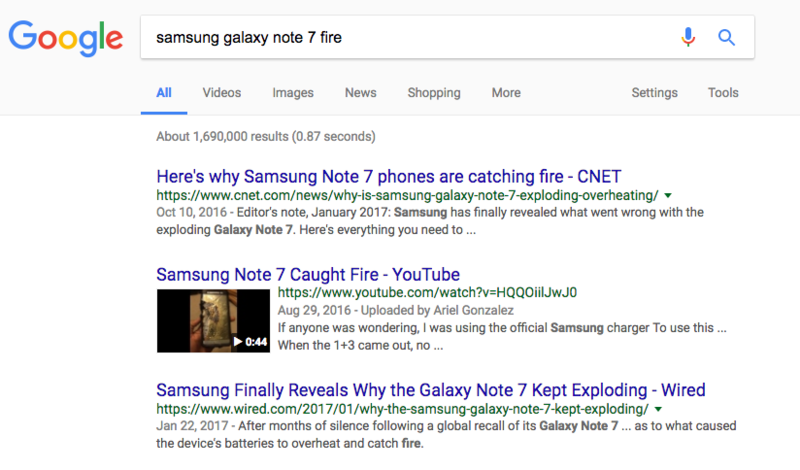 But it was too late: Some consumers started referring to the model as "Death Note 7." It was a PR disaster. Samsung lost billions of dollars in sales. In situations like this, while little can be done to erase the public’s sentiment, the company could bid on branded terms that include unfavorable keywords and point customers to a landing page that provides a rebuttal, explanation, or instructions on how to get a refund. PR crisis mitigation is not just for large brands like Samsung. Smaller businesses can also benefit from proactive brand-saving paid search strategies to handle negative reviews and product recalls. A nightmare for a brand can open up an opportunity for its competitors. Delta and Lyft, for example, are famous to respond quickly to their competitors’ missteps on social media. In response to “#DeleteUber” sexual harassment scandal, Lyft pledged a million dollars to the American Civil Liberties Union and launched a campaign called “Round up & Donate.” The lesson? Companies should be monitoring their competitors' brands as closely as their own. Trade shows take weeks of planning and thousands of dollars in the associated costs and fees. Naturally, marketers want to deliver the best ROI. Paid search can capture relevant leads and even help you test if you should make that investment in the first place. Take Dmexco, for example, a must-attend digital marketing event in Cologne, Germany. IBM and AdSparc placed bids on “dmexco 2017” search query to drive the event's attendees to their dedicated landing pages. 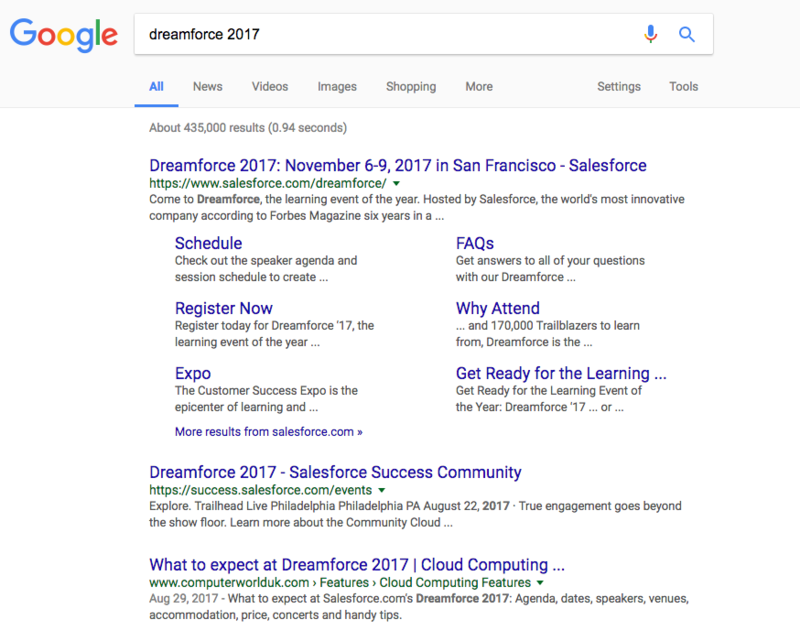 For Dreamforce 2017, as you can see below, the opportunity is up for grabs. Paid search can boost your company's presence and reputation -- and not just in times of crisis. To leverage PPC for brand awareness, think beyond branded terms bidding and competitor search queries. For maximum impact, consider online trends and news, your company’s (and your competitors') reputation, reviews, and upcoming industry events. We post on this blog around three times a week. Want to join 40,000+ marketers and get a free weekly update? Sign up and join our email list.